"Trending" has become the keyword in today's day and age. In the space where I am the topic that is trending these days is #claypot. Cooking in clay seems to be in. Tagines from Morocco , the Spanish Cazuela used a Lot in Basque cooking , the Chinese sand pot (Saw Kuo) and the Palayok of the Philippines are showing up in menus and in the news of late. So lets give this a thought and some research. Needless to say after humans figured out that fire cooked food and made it tastier. 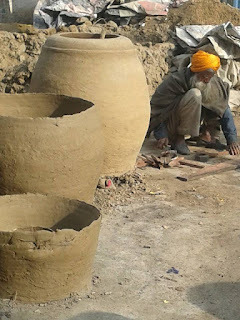 They possibly looked for a medium to cook in to extend their knowledge of pit and spit cooking, according to my friend and an eminent food writer Rahul Verma, the first cooking utensils were tree barks, essentially to hold some liquid and provide a layer of separation to avoid food chaaring. It was soon replaced by clay (around 15,000 years ago!) and clay pot cooking has stayed on ever since. Whether it is the sarson ka saag and urad dal that is cooked in the "Taudis" of Punjab , the fish Curries cooked in the "Kundlems" of the local dhabas (Khanawats) of Goa (some of them still remain in Bicholim Taluka) or the Malwan fish curry and the dish that I hold a special bias towards - the Syrian Christian fish curry which tastes the most superb the next day, left in the chatti that its cooked in. (Have to mention the kullarh waali chai, the raarha doodh and Mishti doi). I have always believed that our relationship to food is an extension of our relationship to life and aspects around us. Earth and clay have been our bond to nature; philosophically from time immemorial earth has always stood for life and rebirth. As a chef seeing a claypot is a comforting sign because it shows we're going back to our roots yet again. All that this humble chef asks is to look inwards at our cuisine as well when appreciating "foren claypot cuisine", as "mitti" has always been the essence of Indian food and philosophy. Back to the Basics, or Reaching your Roots... Its a nice way to put how earlier days of cooking although may not have a literal science behind cooking, did things quite scientifically. Its so intriguing... Well written and nicely said, would be an understatement, but I m short of words here.